Most dance enthusiasts will be familiar with Wim Wenders' documentary "Pina", which made a splash in 2011 for its beautiful use of 3D film and its release soon after choreographer Pina Bausch's death. Chantal Akerman's 1983 "One Day Pina Asked...", which will be shown in a rare retrospective screening during this year's Dance on Camera series, is a very different film, and worth watching. Less glossy, more tolerant of silence and stillness, it comes much closer to Bausch's aesthetic and emotional truth. At the beginning of the film, as we catch a glimpse of one of Bausch's works ("Come Dance With Me") through an open door, Akerman tells us that the film is not a documentary, but a series of impressions. 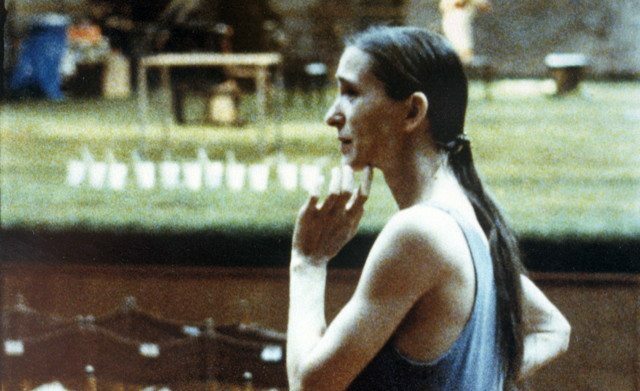 Created over a five-week period during which Akerman traveled with the company, it features interviews with dancers, footage of the company backstage in rehearsal, and excerpts from several pieces, including "Carnations", "Waltzer", and "1980". In one of the film's most compelling sequences, a company member demonstrates the song "The Man I Love" in sign language -- a vignette that eventually made its way into one of Bausch's works. As he signs and speaks the words, voice hoarse, over the song playing in the background, he seems to believe, entirely, in what he is doing. Unlike much choreography, Bausch's work translates well to film, and it's no surprise: the dancers' faces and bodies -- even when barely moving -- express deeply human, and often painful, emotion. Fortunately, Akerman doesn't shy away from their humanity. "One Day Pina Asked..." will be screened on Saturday, February 1 at 11AM. In "Paul Taylor: Creative Domain", Taylor, speaking to the camera, muses: "Because of the nature of dancing happening in the split instant, you have learn to live that way, too." This elusive "split instant" -- where it comes from, how it evolves into a complete work -- becomes a subject of Kate Geis's new documentary on Paul Taylor, one of the major forces of modern dance in the 20th and 21st centuries. She unobtrusively follows the choreographer as he creates a new work (eventually titled "Three Dubious Memories"), which begins its life as a piece of music by Peter Elyakim Taussig and a vague desire to create something about memory -- perhaps, like "Rashomon", a piece with several versions of events. Watching his work with the dancers is fascinating -- he is focused and serious but good-humored -- and the interviews with the dancers about their relationship with him and the work is enlightening. As for the piece itself? While perhaps not a classic like Taylor's "Esplanade", it is an intriguing piece of choreography -- quite different from much of his work. And the opportunity to witness its creation is a privilege. "Paul Taylor: Creative Domain" will have its world premiere on Tuesday, February 4 at 9PM. Director Kate Geis and featured dancers will be present. Part of the Dance on Camera series, co-presented by Dance Films Association and the Film Society of Lincoln Center. Hanna is an arts writer and editor. She lives in Brooklyn.